New Delhi, 13th February, 2017. The Income Tax Department (ITD) had initiated ‘Operation Clean Money‘ on 31st January, 2017 for the e-verification of large cash deposits made during 9th November to 30th December, 2016. Email and SMS were sent to 18 lakh taxpayers for submitting online response on the e-filing portal. The operation has seen an overwhelming response and till 12th February, 2017 more than 5.27 Lakh taxpayers have already submitted their response. Out of the 7.41 Lakh accounts confirmed by the 5.27 Lakh taxpayers, the cash deposit amount has been confirmed in more than 99.5% accounts. The Department is encouraged to note that taxpayers have increased the cash deposit amount in nearly 90,000 accounts and provided details of additional 25,000 bank accounts in which cash was deposited. The explanation of cash deposit submitted by the taxpayer is being analysed in the context of nature of business and business profile in the earlier returns of the taxpayer. This exercise has identified around 4.84 lakh taxpayers not yet registered with the e-filing portal. SMS has been sent on the mobile number of these unregistered persons. 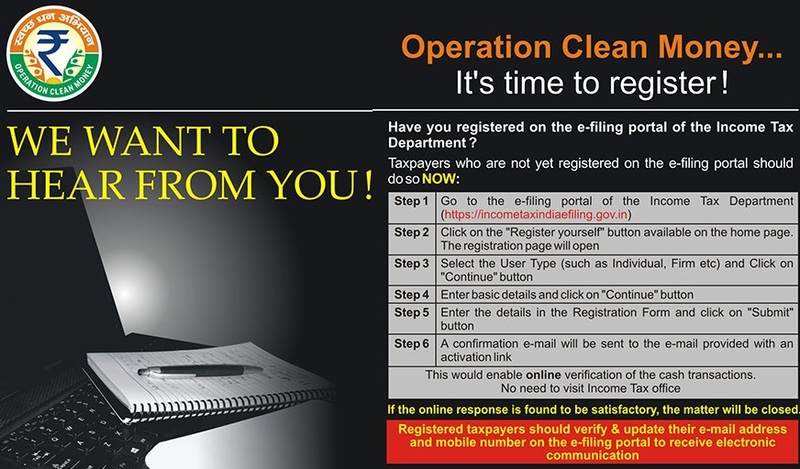 Income Tax Department is keeping a vigil on the PAN holders who have still not registered on the e-filing portal or who have not yet submitted their online response. Such taxpayers are advised to register themselves at the e-filing portal https://incometaxindiaefiling.gov.in. and submit online explanation. In order to facilitate online responses, the last date for their submission has been extended up to 15th February, 2017 and a detailed Frequently Asked Question (FAQs) has also been issued to assist the taxpayers in submitting their response. The taxpayers should submit their response within this further extended period with a view to avoid enforcement actions under the Income-tax Act and other applicable laws.